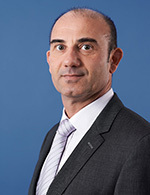 As General Manager Operations, Fanis is responsible for all aspects related to operations across LNG carriers by providing leadership to multifunctional teams, ensuring that systems and process management procedures are developed, implemented and standardized to ensure GasLog fleet is running safely and effectively. Close to 25 years' experience in the shipping industry, mainly involved with the operation of oil, chemical and for the last 15 years LNG tankers. Served in various positions within GasLog (prior 'Ceres LNG') since 2005 and as Innovation & Technology Manager & Deputy GM from 2010 to 2014. Worked at Ceres Hellenic Shipping Enterprises from 1998 to 2005 as a Superintendent Engineer, New Building Site Manager and later on as Ship Manager. Graduate of the National Technical University of Greece, has an MSc in Chemical Engineering and an MSc in Naval Architecture & Marine Engineering.